The graph above shows us an overall view of what has gone on over the course of the past few weeks since we started collecting Twitter data and identifies different campaigns during this time. The seemingly small volumes of tweets, in relation to the total population, comes from the following factors: the way the streaming API is set up, we do not get access to 100% of the tweets but more a random sampling of tweets from all around the world, ranging from 1% up to 50% allegedly, which we then filter by relevant keywords; we process English only tweets so that we can match as many words as possible to our data dictionary; the geo-location process requires us to use the user specified location and create a hierarchy of city, province, country in the data; and finally to get increased accuracy of sentiment without delving too deeply into Natural Language Processing or topic detection, we leave tweets with one mention of a party as this leaves a high probability of subject of the tweet being said party mentioned. This filters the data efficiently – if somewhat coarsely – but provides a more accurate view of twitter users opinions about this specific topic while providing a descriptive geographic view of the country. Using the spikes in the graphs timeline, we were able to identify various campaigns different political parties intentionally or unintentionally started. All parties have spikes towards the beginning of July and the end of July corresponding to the build-up of the campaign trails and rallies. 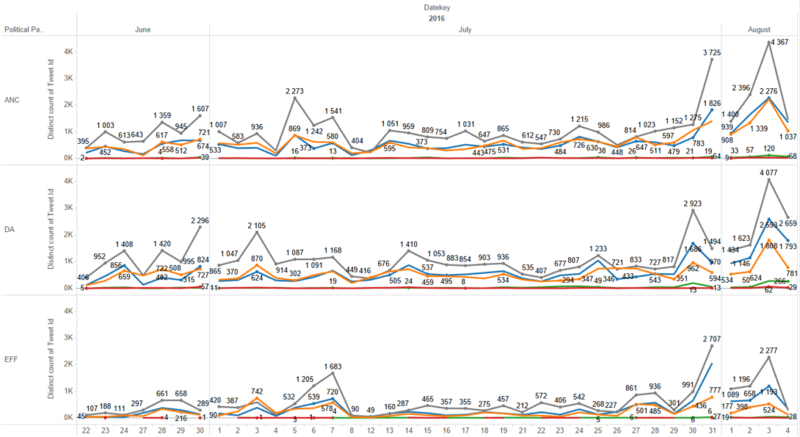 Looking into this in chronological order: the 3rd of July shows a spike in sentiment and tweet volumes for the DA. This is largely as a result of the #callMmusiBack (with 423 mentions throughout the day) trend and related sentiment in which the public expressed its frustration with the DA’s persistent call and text campaign. The DA responded to this with its “whileYouComplainAboutAnSms” trend (with 595 uses of the hashtag throughout the day) and the whole account bore a slightly more negative sentiment for the DA. July 5th saw a spike for the ANC. Equal numbers of positive and negative sentiments relate to different topics. The more positive sentiments were directed at the campaign trail with the development of the hashtag #ANCinTshwane (with 785 uses of the hashtag throughout the day) while the more negative ones were all related to the #SABCcensorship (with 521 uses), #SABC – had a total of 1564 tweets. This falls in line with the press briefing of the ANC leadership on the issue of the SABC saga . July 6th and 7th were significant key dates for the EFF as it seems as though they gained momentum on the sixth at Mahikeng and continued to climb on the 7th at Rustenburg with the sentiment being slightly more positive than negative. From the 7th onwards, it seems as if the EFF was the only party with an observable ‘very positive’ sentiment. Their follower base is small but very emotive and in a positive way. The most used hashtag on the 6th of July is #effwayawaya (with over 1000 uses throughout the day) with #voteEff following (with 600 uses), @effSouthAfrica is mentioned 3300 times throughout the day; and on the 7th of July is #Rustenburg (with the second most frequently used hashtag at 1372 after #justiceForAltonSterling) and #effwayawaya (with 1209 uses throughout the day). The most pertinent issues seem to relate to the promised clinics, sanitary pads for women and education (in relation to the positive sentiment). There was negative sentiment related to burning property in their name “RT @EFFSouthAfrica: Malema: stop burning things in our name. Here in #Mafikeng campus they burned the university, don't ever do such things…”. Summarizing trends, we see that for the large part, the DA have a consistently large volume of tweets with positive sentiment greater than negative sentiment. The final rally increased activity but not as dramatically as the ANC or as positively as the EFF. The most polarized party appears to be the EFF with the greatest number of observable ‘very positive’ or ‘very negative’ tweets. In fact, it has significantly less ‘very negative tweets than either of the other parties. While this does coincide with expectations, it might be as a result of low tweet volumes and loss of demographics on the platform itself. The final and most dramatic sentiment spiking day was the voting day August 3rd, where we saw almost double the tweet volume as the large activity increase seen over the final rally weekend. The population remained positive more than negative as well as very positive sentiments having just under four times more tweets than very negative sentiments. This possibly suggests the overall election voting day was a success with few incidents and hopefully this outlook while maintain through to the weekend when final results are determined. In the above graph, the figure for Gauteng is 171 049 tweets. We hope that people retain their positive sentiments they had leading up to and on voting day and that the winning party facilitate and uphold that sentiment throughout. This is the final post before the elections results are released and may the best person win.